aa Verheij, B., & Hage, J.C. (1993). Reason Based Logic in Law. Towards a global expert system in law. A glance at the conference (eds. Bargellini, G., & Binazzi, S.), 110-111. Florence. aa Verheij, B. (2000). Logic and Reasoning 1 (BNAIC 2000 Report). BNVKI Newsletter 17 (6), 132-133.
aa Verheij, B. (1998). Automatisch Categoriseren van Tekst en Mogelijke Toepassingen in de Rechtsinformatica. Bespreking van Lezing door Marie-Francine Moens. NVKI Nieuwsbrief 15 (2), 51-52.
aa Verheij, B. (1995). 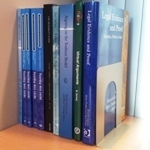 Frame-Based Conceptual Models of Statute Law. Bespreking Lezing Robert van Kralingen. NVKI Nieuwsbrief 12 (5), 129-130.
aa Verheij, B. (1995). Rules and Reasons: from Ontology to Rational Standards for Defeasible Reasoning. Report SKBS/B3.A/95-07 . aa Verheij, B. (1993). ARCHIMEDES Legal Object and Link Types in the ARCHIMEDES Information Network. Report SKBS/B3.A/93-02 . aa Verheij, B. (1993). ARCHIMEDES Reason Based Logic Formalized. Report SKBS/B3.A/93-13 . aa Verheij, B. (1992). Derde Bijeenkomst Werkgroep Logica en Recht. NVKI Nieuwsbrief 9 (4), 123-124.
aa Verheij, B. (1992). Het ARCHIMEDES Project: Slim Zoeken in Veel Informatiebronnen. Hypothetische Conclusies van de Beoogde Dissertaties Assistenten in Opleiding Jaargang 1992 .
aa Hage, J.C., Span, G., Verheij, B., & Lodder, A.R. (1992). ARCHIMEDES An Illustrated Overview of the Legal Applications. Report SKBS/B3.A/92-09 . The IPN Special Interest Group AI has written a Dutch AI Manifesto emphasising three research focus areas for the coming decades: Socially-Aware AI, Explainable AI and Responsible AI. Dinner with speakers (`kennisdiner' with historian Jan Blaauw, medical researcher Désirée Goubert, `theatermaakster' Sarah Moeremans). Location: Grand Theatre. Catering: Kruimels. Report `Arguing over dinner' in the Universiteitskrant in English and in Dutch. - In your motivation letter, you should apply for a specific project or projects. - There are restrictions: you should not have resided or carried out your main activity in The Netherlands for more than 12 months in the three years before July 15, 2017.
defends his dissertation `Designing and Understanding Forensic Bayesian Networks using Argumentation' in Utrecht.